WeGuess is the funniest, most innovative and intriguing quiz game for iPhone, iPod Touch and iPad! A quiz just like any other? NO WAY! You have never seen a game like this before! 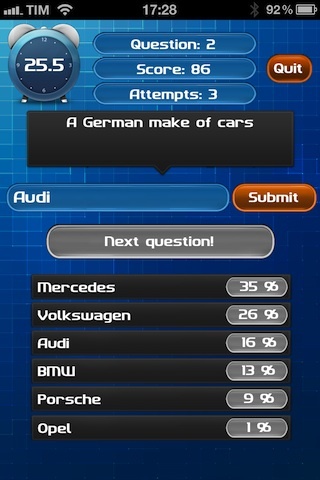 WeGuess doesn't feature just one correct answer, in fact the correct answers can be UP TO SEVEN! The answers are never too obvious, you will get better and better and WeGuess will capture you more and more as you play! 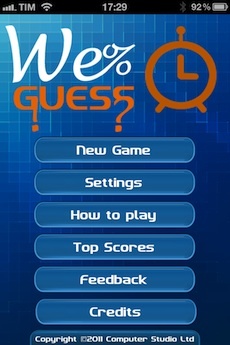 WeGuess features questions on any subject: General Knowledge, Sports, Current Events, Travel and Geography.. and much more! The fun never ends with WeGuess! A DIFFERENT QUESTION EVERY NEW GAME! WeGuess features a database of more than 500 UNIQUE QUESTIONS, which are never going to be repeated until you have exhausted them all. More questions are planned for future updates… free of charge, of course! HOURS UPON HOURS, DAYS UPON DAYS OF PURE ENTERTAINMENT! Every game only lasts for a few minutes: you can play dozens of games during your lunch break or just one game while waiting for the bus. Any bit of spare time is just perfect for WeGuess.. guaranteed fun all the way through! 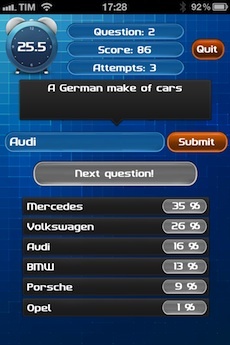 As you advance through the game, the number of correct answers available will decrease, making the game more challenging. Pay attention at the alarm clock too as you only have a limited time to think and type! Are you ready to be the next victim of the WeGuess mania? INTUITION: THE KEY TO WIN! Yes, that's right! 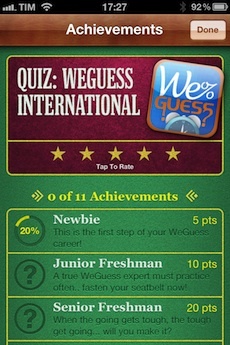 To get to the top of WeGuess Top Scores chart you need to develop your intuition. Each question you get asked has also been subjected to 100 different people before you. What answers have they given? You have up to SEVEN correct answers (depending on where you are in the game)… Intuition and practice will get you to the top! Play as a team! It's much funnier when you play together with your friends! GAME CENTER COMPATIBILITY: CHALLENGE OTHER PLAYERS FROM ALL OVER THE WORLD! 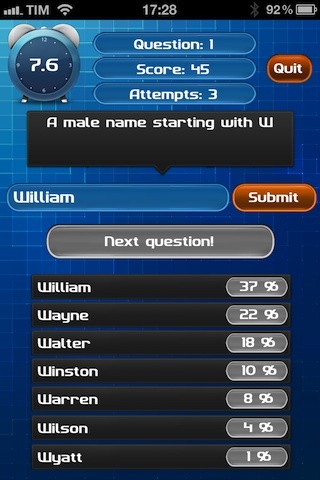 WeGuess automatically sends your score to Game Center! Get ready to grab your virtual trophy and see how well you are doing! WHAT ARE YOU WAITING FOR? GET YOUR COPY OF WEGUESS NOW… AND LET THE FUN ROLL IN! "If you belong to those who love to try something really different, you should definitely try WeGuess!" "It's a fantastic game! It's just soooo addictive! I have lost count of the times where I said to myself "just one more game" to find myself still playing after an hour! WeGuess is my favourite game now! Please, please, please keep working on this project!". "I want to tell you that you have released a lovely application. I love it. Thank you"